I had the privilege of visiting a lady today who supervised a cleaning crew at a major university. Many people would clean, supervise their employees, clock out for the day, repeat the same duties the next day, and view the students as the ones who make the messes she and others have to clean. Not this lady! She went the extra mile. You may read this and wonder why she or any other supervisor would go above and beyond. Isn’t everything great as long as you get your job done? Why do anything extra? These college students are more than likely absorbed in their college drama with classes, relationships, etc. and don’t care about hearing a thing from “the cleaning lady”. Do you think that stopped this lady? NO! She would overhear them talking disrespectfully to their parents over the phone, so she would wait and address them for their disrespect. She didn’t have to do that. Many students would hate her for what they perceive as butting in to their business, but many of these students who received a word of correction from this lady stay in contact. She is retired now, but the impact she made in their lives still lives on because she went the extra mile and stepped in like a loving mother. Many of us are busy clocking in and out, collecting our checks, and missing the bigger picture. Meanwhile there are people around us who need some loving correction and direction. 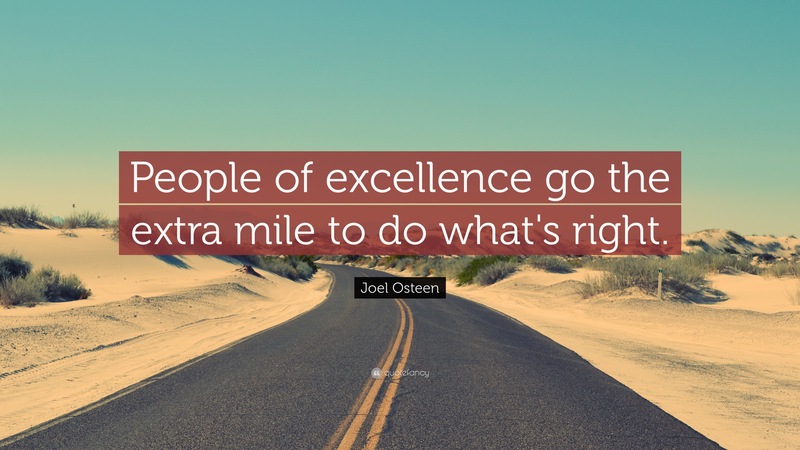 Will you and I be the ones who care enough to go the extra mile?